Quirky Ceramics Tell Fascinating Tales A new exhibit, “Mementos of the Great War: Toby Jugs Commemorating Allied Leaders of World War I,” is open to the public in the Watson Pavilion at Washington and Lee University through December 2017. 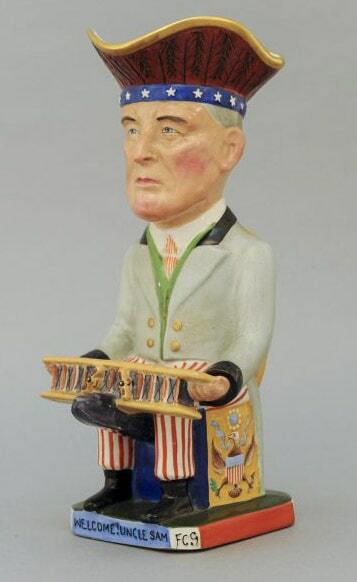 In 1918, to celebrate the United States’ entrance into World War I a year earlier, the A. J. Wilkinson Pottery issued a Toby jug modeled after Woodrow Wilson. Dressed as Uncle Sam, Wilson sits on a biplane, “giving,” as one British advertisement suggested, “the idea that he is sending it over to the Front to join us in our One Great Cause.” To ensure that the sentiments represented by the jug are clear, “Welcome Uncle Sam!” is emblazoned around the base. The jug joined 11 others that had been produced by Wilkinson to commemorate allied English and French military and civilian leaders of World War I. The jugs were designed by Francis Carruthers Gould, a popular political cartoonist of the time, and were retailed by Soane & Smith Ltd., a high-end ceramics and glass dealer in London. The first jug, depicting Field Marshal Herbert Kitchener, Secretary of State for War, appeared in January 1915. Others were put into production as new figures gained prominence. A twelfth jug depicting Winston Churchill as the First Lord of the Admiralty (a position he held from 1911 to 1915) was not produced until 1941. The reason for the delay of more than two decades is thought to have been Churchill’s connection to the disastrous defeat at Gallipoli. The design was revived and put into production after Churchill became Prime Minister. The jugs were issued in limited editions of from 250 to 1,000 (Kitchener got only 250 while King George V got 1,000), and were advertised as an investment; Soane & Smith somewhat self-servingly asked “we quite realize that economy is the order of the day, but what is a good investment but economy in its finest form? Why not, therefore, procure your set before the prices increase still further?” The jugs were also donated to charitable auctions and raffles raising money for the war effort; one jug depicting Admiral Jellicoe made £296. The full set of jugs, on loan from W&L alumnus Bruce C. Perkins, is featured in the exhibit “Mementos of the Great War: Toby Jugs Commemorating the Allied Leaders of World War I.” Perkins loaned the jugs to W&L to help mark the 100th anniversary of the U.S.’s entrance into WWI. The exhibit will be on display in the Watson Pavilion through December 2017. For more information about the exhibit, click here.